With progressive trends toward fewer children and more elderly, greater information, and more internationalization, welfare needs are becoming more diversified and more complex. JIU prepared for arrival of the advanced welfare society by putting effort into expansion and development of its social work studies courses and of educational research, and establishing a social work studies course within the Graduate School of Humanities. In April 2005, however, this course was upgraded into its own Graduate School of Social Work Studies, for advanced and diverse research activities that aim for the development of instructors in social welfare education toward the training of advanced welfare specialists, community workers, social welfare facility managers, and medical social workers. 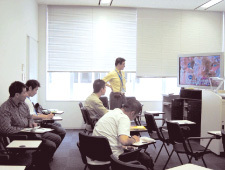 In April 2005, about half of the courses, including the research and practice courses, were transferred to the Kioicho, Tokyo campus, for development of a curriculum structure that that caters particularly to the needs of graduate students also working at regular jobs. Social welfare programs and policies, international welfare research, IT and welfare, etc.